^ State of New Mexico (July 2012). Kathryn A. Flynn (ed.). 2012 Centennial Blue Book (PDF). Diana J. Duran. 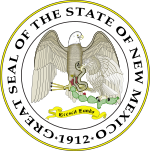 Office of the New Mexico Secretary of State. pp. 227–229.